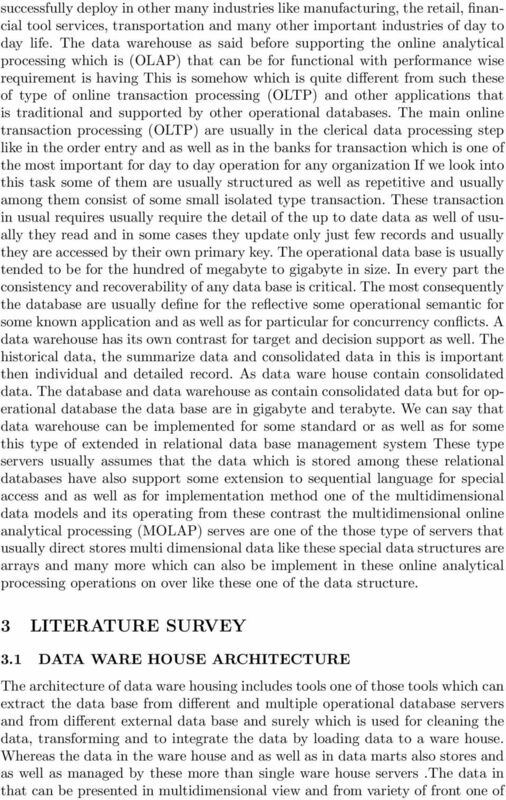 Download "LITERATURE SURVEY ON DATA WAREHOUSE AND ITS TECHNIQUES"
3 the end tool as well as query tools for these such report writing analyzing tools and at the last for the data mining tools. As we also know that there is also repository for storing the data and as well as for staging the data and as well as the staging the metadata and the last also the tools which is represent that the monitoring and administering the warehouse system. 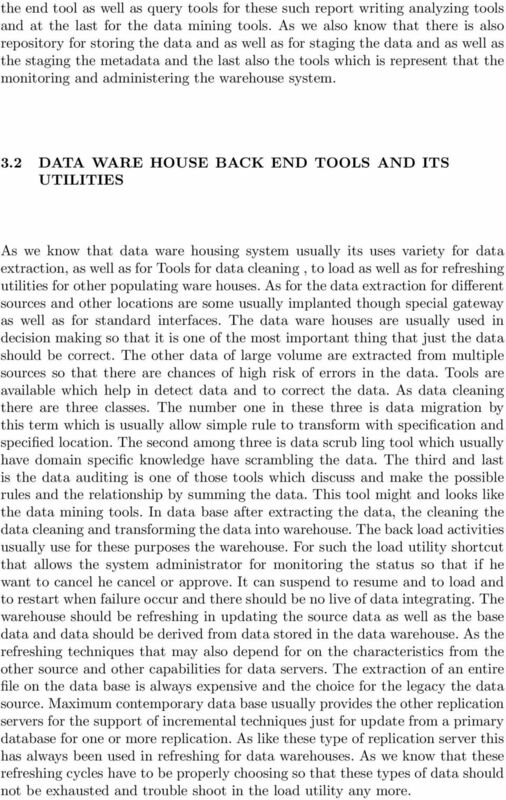 3.2 DATA WARE HOUSE BACK END TOOLS AND ITS UTILITIES As we know that data ware housing system usually its uses variety for data extraction, as well as for Tools for data cleaning, to load as well as for refreshing utilities for other populating ware houses. As for the data extraction for different sources and other locations are some usually implanted though special gateway as well as for standard interfaces. The data ware houses are usually used in decision making so that it is one of the most important thing that just the data should be correct. The other data of large volume are extracted from multiple sources so that there are chances of high risk of errors in the data. Tools are available which help in detect data and to correct the data. As data cleaning there are three classes. The number one in these three is data migration by this term which is usually allow simple rule to transform with specification and specified location. The second among three is data scrub ling tool which usually have domain specific knowledge have scrambling the data. The third and last is the data auditing is one of those tools which discuss and make the possible rules and the relationship by summing the data. This tool might and looks like the data mining tools. In data base after extracting the data, the cleaning the data cleaning and transforming the data into warehouse. The back load activities usually use for these purposes the warehouse. For such the load utility shortcut that allows the system administrator for monitoring the status so that if he want to cancel he cancel or approve. It can suspend to resume and to load and to restart when failure occur and there should be no live of data integrating. The warehouse should be refreshing in updating the source data as well as the base data and data should be derived from data stored in the data warehouse. As the refreshing techniques that may also depend for on the characteristics from the other source and other capabilities for data servers. The extraction of an entire file on the data base is always expensive and the choice for the legacy the data source. Maximum contemporary data base usually provides the other replication servers for the support of incremental techniques just for update from a primary database for one or more replication. As like these type of replication server this has always been used in refreshing for data warehouses. As we know that these refreshing cycles have to be properly choosing so that these types of data should not be exhausted and trouble shoot in the load utility any more. 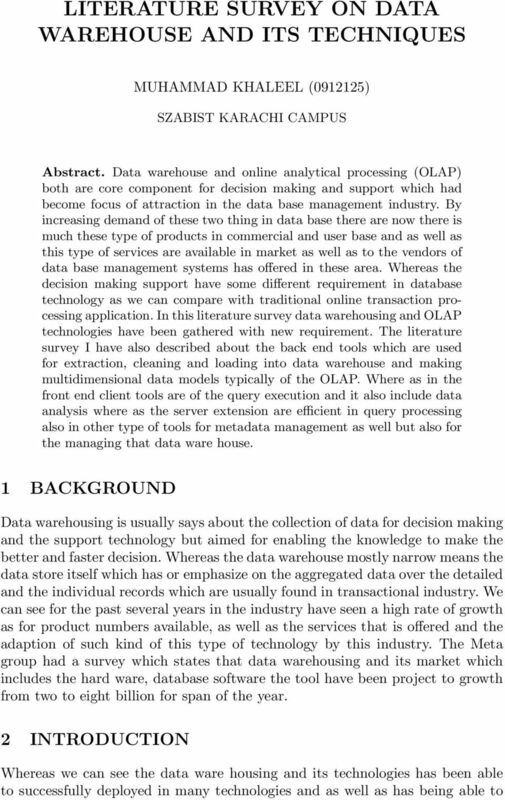 OLAP and Data Warehousing! Introduction! Outline. Data Warehousing. What is a Warehouse? What is a Warehouse? Overview. 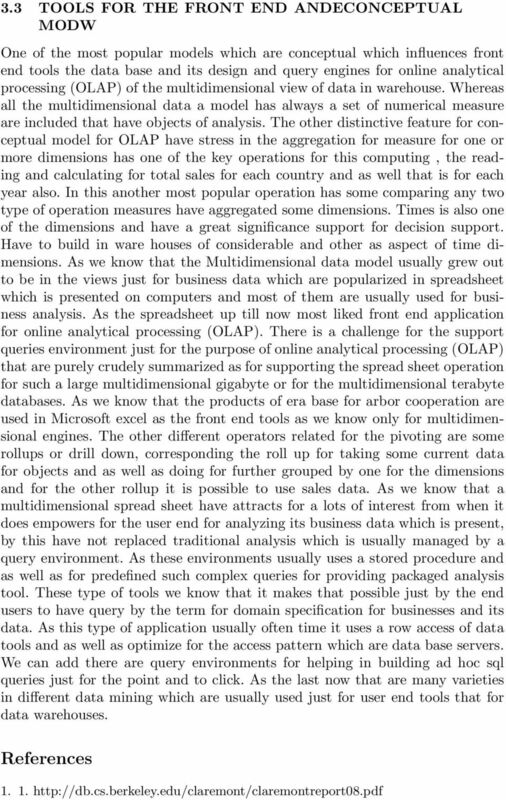 Data Warehousing and Decision Support. Introduction. Three Complementary Trends. Data Warehousing. An Example: The Store (e.g. Data Warehousing: A Technology Review and Update Vernon Hoffner, Ph.D., CCP EntreSoft Resouces, Inc. This tutorial will help computer science graduates to understand the basic-toadvanced concepts related to data warehousing.